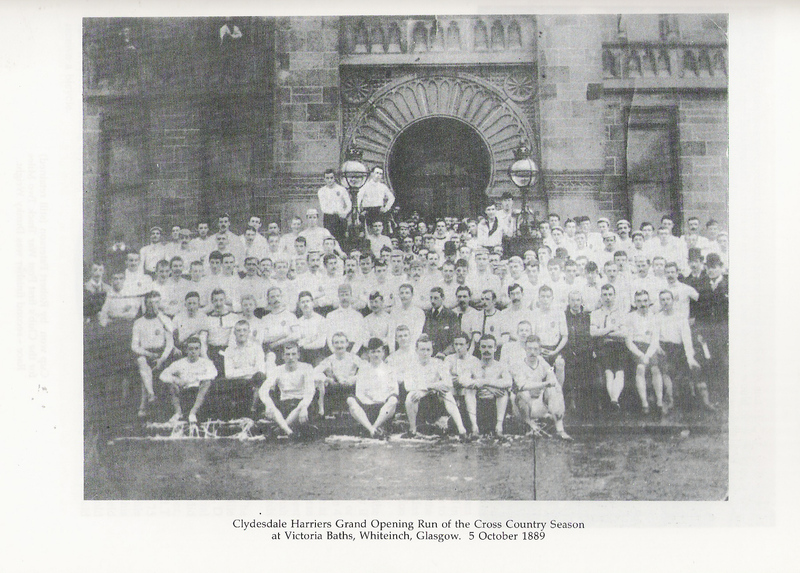 Clydesdale Harriers was the first open athletic club in Scotland having been established in May 1885. So much could be said about the immense amount of pioneering work that they did that it would take more than single webpage to cover it. It cannot be done like other clubs – there was nothing but a two-club national for competition so progress via the Districts, the Edinburgh to Glasgow, etc is impossible. How does a club in a competitive sport develop? Basically they developed their own internal competition – one of the advantages of the sections that they developed around the country. What we will do is (a) outline the history of the club briefly; (b) look at how it developed via (i) its constitution; and (ii) the club handbook for member’s ticket which was extremely comprehensive; an finally some of the founders not already covered in their own right. The Clydesdale Harriers club officials were gratified with the response to their Youth Ballot Team Race when 57 Under 17’s toed the line on 4th November 1945 at Clydebank. So much so, they will endeavour to make this an annual event taking the place of an Open Cross-Country handicap which the club formerly sponsored, and which was decided over a seven miles course from Scotstoun Showground, always on the first Saturday in November. Schools and like organisations had, of course, taken part in the good, old-fashioned type of paper chase but in September 1885 the good people of Mulguy were privileged by being the first ever in Scotland to witness a cross-country run as we know it today. And it was not a half hearted measure at that, as the hares covered a distance of thirteen miles taking around two hours to do the journey. A touch of colour was lent to the procedings in these days by the Whip carrying a hunting horn, and we never heard of anyone not having sufficient breath left to executehis duty when necessary. The object of the club as always embodied in its constitution was the promotion of amateur athletics in general and cross-country running in particular, but in the early excitement of a new adventure, the committee was not hidebound by convention in their interpretation of this rule. Thus it occasions no surprise to find, in an early copy of the annual report, that the 20 mile cycling championship of the club was won by the famous RA Vogt. Shortly after this, boxing was embraced in the list of club activities, and not only had Clydesdale Harriers the honour of introduycing open-air boxing to the Glasgow public, but had under their wing the late Ralph Erskine, a world amateur champion of his day. The whole of the West of Scotland was combed in an effort to enlist recruits under the amateur athletics banner and amongstothers in the very early days we find such well-known erformersin the Clydesdale colours such as, James Henderson of Chryston; Jimmie Campbell, Helensburgh; James Logan, Vale of Leven; William Thomson and John Clelland of Larkhall; AP Findlay and R Dickie, Ayr; and Andrew Hannah and Charlie Pennycook, Glasgow. Of course the path of progress was not exactly strewn with roses at the outset, and in 1886, a break-away from the club resulted in the formation of the West of Scotland Harriers club. Just before this time, Edinburgh Harriers Club had been founded by the late David S Duncan, and these were the ‘Big Three’ in amateur athletics in this era. 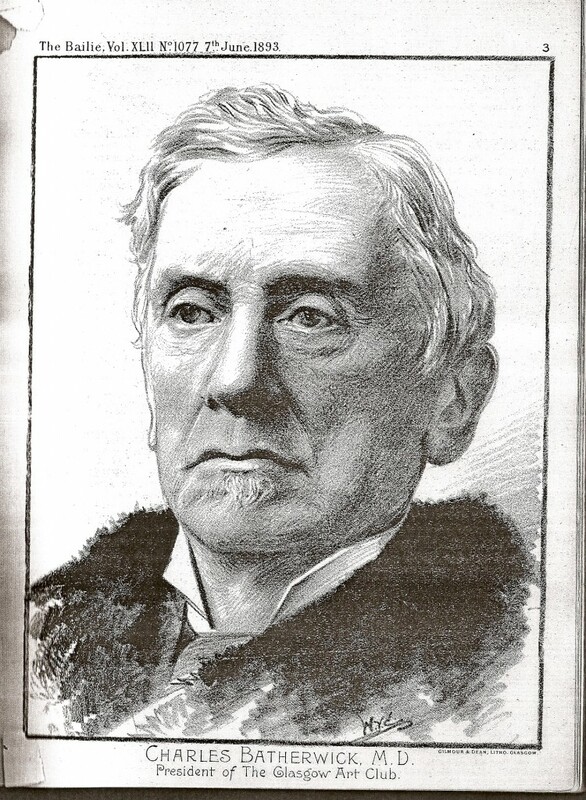 In 1888 Clydesdale gained a slight edge on their rivals when they took the decision to form sections in Ayrshire, Dunbartonshire, Lanarkshire and Stirlingshire. Each section possessed the advantages of a district club whilst enjoying the support and assistance of the parent body. 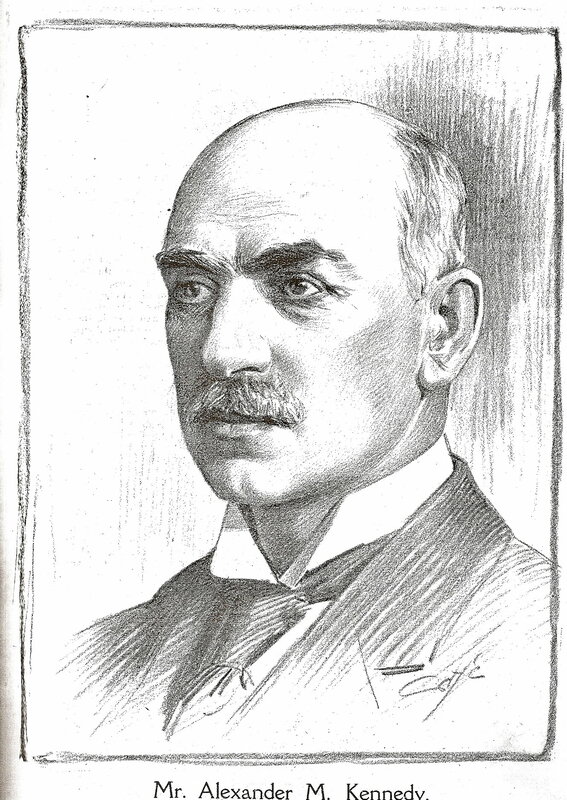 Enterprise had its own reward and in 1893 the membership of the club had risen to its peak and the astonishing total of 1081 fully paid members – a remarkable achievement. The club, in its early ventures as Open Sports Meeting Promoters, introduced many notable performers to Glasgow, but for a long period Clydesdale Harriers Sports Meeting and bad wether were synonymous terms. So much so that we hearof a guarantee fund being called up and members paying £2 per head to defray expenses. In 1910, the National Cross Country Union ordained that sections were not admissible and in consequence activities were confined to Glasgow, but thanks to an energetic committee, from that date until 1914, the club entered one of its most prosperous periods. The opening run at Clydebank in 1912 drew over 100 runners, whilst in 1911, 1912 and 1913 sixty competitors was an average field in the club novice cc championship. During the track season, the fortnightly confined competition attracted more competitors than the average open sports meeting. Then August 1914 – operations were suspended sine die and the club funds distributed among war charities. Withe a nucleus of members in Clydebank, it was decided after cessation of hostilities in 1918, to restart in this centre, and as a result the ship building town became the headquarters of the Clydesdale Club as we know it today. From that date, the glory of the ‘C’ uniform was dimmer than in days of yore, but the Clydebank pioneers never gave up trying. The name of the late Matthew Dickson will be familiar to an oder generation . Matthew Dickson was SAAA Treasurer for 19 years. Alex McGregor, Willie Gardner, John Kirkland, Charlie Middler and Tom Millar all have ‘Clydesdale’ for their middle name. Over the last quarter of a century there have only been five occupants of the Club President’s Chair. In 1932 Mr JC Gray, CA, became treasurer and still executes this duty most effectively. Two old members, now settled overseas, John D Semple, successful marathon runner in the United States and Archie Gourley in South Africa are never backward in sending subscriptions, both monetary and in kind. 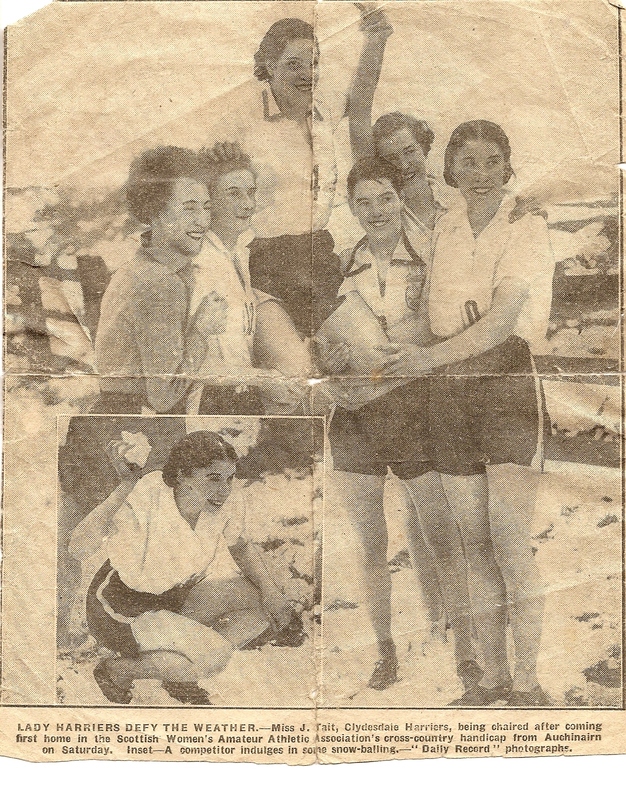 Season 1930 saw a big increase in club membership and that year it was decided to form a Ladies Section. There was no lack of volunteers and in time no lack of talentin this latter force, as evinced by their record. In 1935 Jean Tait brought fresh honours to the old club when she was chosen to represnt Scotland in a cross-country international, and during the following three seasons, 1936/7/8, the club annexed the Ladies Scottish CC Championship title. On the track, also, they had their successes and Allison Ritchie was a good winner of the 880 yards event in 1937. It happened in the good old days, but Clydesdale are still proud of their letter heading which reads “National Champions 14 Times.” And well they might be. In addition, on 18 occasions they supplied the individual winner of this cross-country event. Track championships from 880 yards to ten miles were also won in Clydesdale colours by such “old timers” as D McPhee, S Stevenson, DW Mill, W Robertson and Andrew Hannah. Nevertheless season 1938/39 gave promise of better things to come. Third place was taken in the National Junior Team Championship, while the “big’uns” earned the most improved team medals in the Edinburgh to Glasgow team race. Clydesdale Harriers is steeped in tradition – previous achievements stand out as a guideand an inspiration to present-day members. Patience and enthusiasm on the part of current officials is doing much to restore the old club to its place of former glory.